Wed., Nov. 15, 2017, 3:22 p.m.
CHICAGO – Legal action following the mass shooting at a Las Vegas concert is picking up with lawsuits filed Wednesday on behalf of 14 concertgoers, including some who were shot or injured trying to escape and one woman who is so traumatized that she has since mistaken the sound of rain for gunshots. The hotel-casino from where Stephen Paddock fired, concert organizers and the makers and sellers of a bump stock gun accessory that enabled him to fire rapidly are named as defendants. The court filings argue that they all share blame for the worst mass shooting in recent U.S. history. The challenge for mass-shooting lawsuits is clearing a high legal bar to prove someone other than the shooter bears any responsibility. Such litigation typically drags for years and can end with victims and their families receiving little to nothing. One of those suing, Elisha Seng, described in a phone interview haunting images she can’t dispel – of bullets thudding around her on the concert grounds and of turning to see a young woman covered in blood after being shot, clutching her throat and falling forward. Seng, who wasn’t physically injured, returned to work as a sales representative, but said she quickly tires from her lack of sleep. Going to concert or sports halls can prompt flashbacks. She recently attended a Chicago Blackhawks game and found herself nervously calculating the best escape routes should someone open fire. A Chicago law firm helped to prepare the filings, which include several plaintiffs from the Chicago area. Victims named in the suits also include a California man, Anthony Crisci, who was rushed to a hospital with a gunshot wound in a truck crowded with dead and injured. 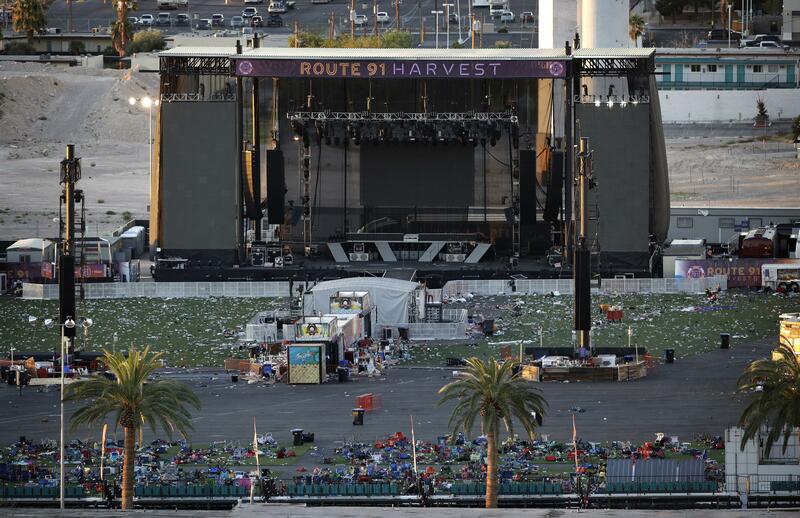 Among deficiencies at the concert venue were poorly marked exits, Wednesday’s filings say. And the hotel, it says, should have had gunfire-location devices that pinpoint where shots are coming from. The 64-year-old Paddock, who killed himself just before his room was stormed, is also named in a bid to seize assets from his estate. Paddock was able to use VIP status conferred on him as a high-stakes gambler to stockpile more than 20 rifles in his hotel suite, including by using exclusive access to a service elevator over days, the filings sat. They argue what should have been routine checks of Paddock’s bags and his room would have revealed his growing arsenal. The filings name a leading bump stock maker, Texas-based Slide Fire Solutions, as a defendant. A lead attorney, Chicago-based Antonio Romanucci, said it wasn’t yet clear which manufacturer, wholesaler or retailer made and sold the specific bump stock that Paddock used, but that the idea was to hold “the entire supply chain” responsible. Messages seeking comment from Slide Fire weren’t returned. Bump stocks were originally created ostensibly to make it easier for people with disabilities to shoot. But the filings allege that Slide Fire geared its marketing to regular gun owners who wanted their semi-automatic rifles to mimic fully automatic weapons. Civil cases in mass shootings are becoming increasingly common. Romanucci has also filed a lawsuit on behalf of victims of the Pulse nightclub shooting that killed 49 people last year in Orlando, Florida. It alleges, among other things, that a security firm that once employed gunman Omar Mateen knew Mateen was mentally unstable and had threatened violence, and should have alerted authorities. Mateen was killed in a shootout with police. Cho killed himself after his rampage. Seng said she joined the civil case to force better security at concerts and at hotels. She said she can’t fathom how a hotel-casino that devotes so many resources to catching gamblers that cheat didn’t notice Paddock bringing in high-powered weapons over a number of days. Published: Nov. 15, 2017, 3:22 p.m.